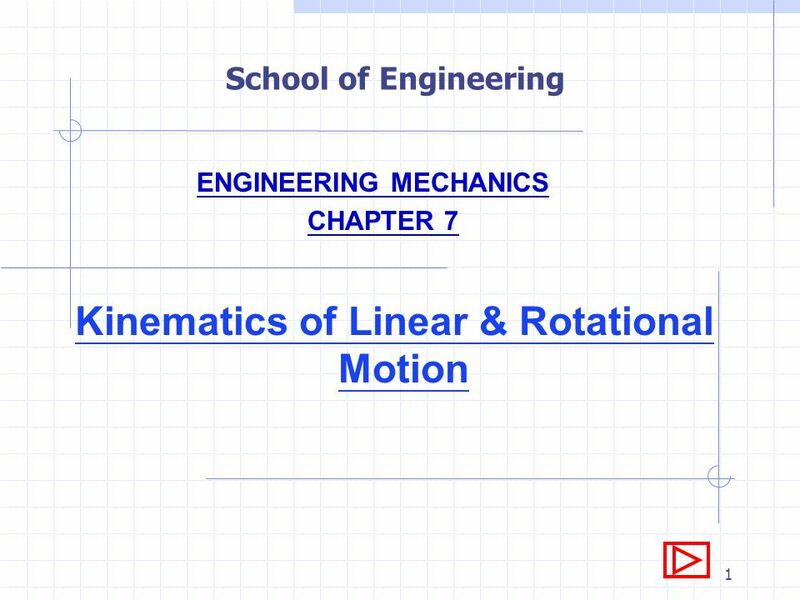 School of Engineering ENGINEERING MECHANICS CHAPTER 7 Kinematics of Linear & Rotational Motion Click on VIEW and select SLIDE SHOW to view the presentation. 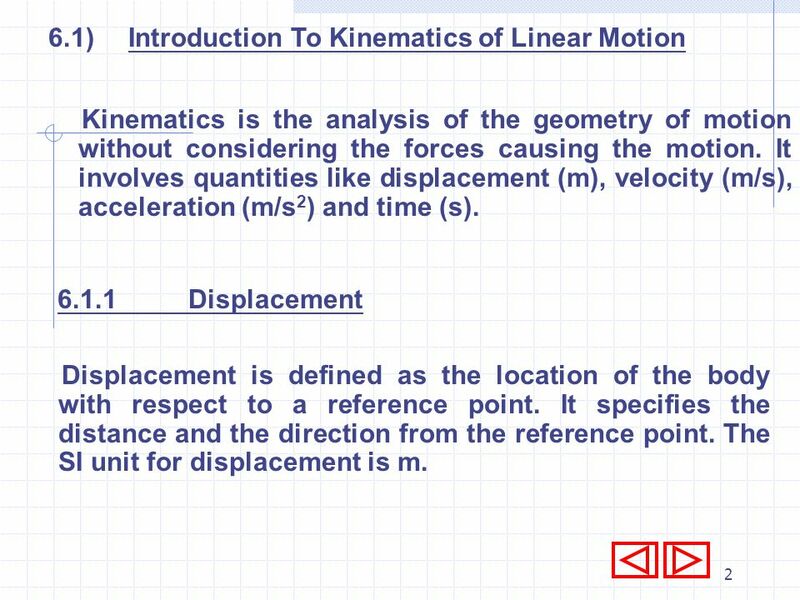 Kinematics is the analysis of the geometry of motion without considering the forces causing the motion. 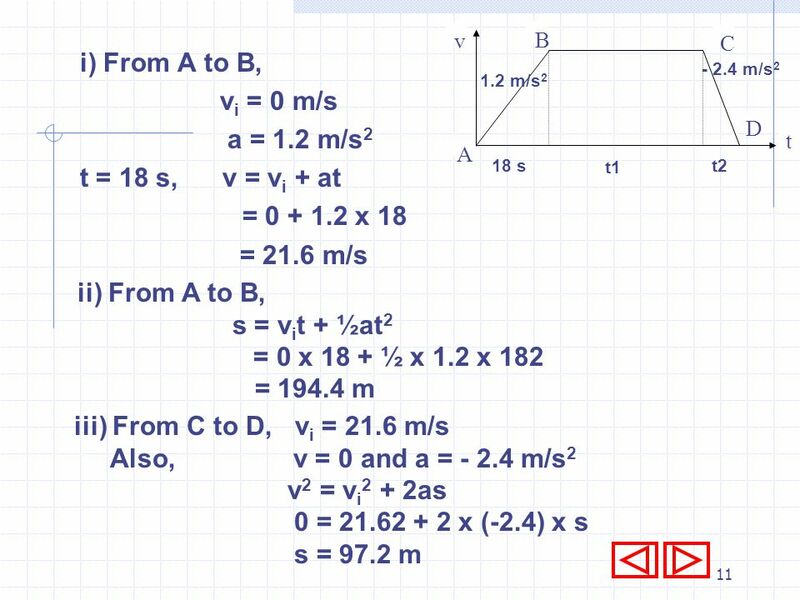 It involves quantities like displacement (m), velocity (m/s), acceleration (m/s2) and time (s). 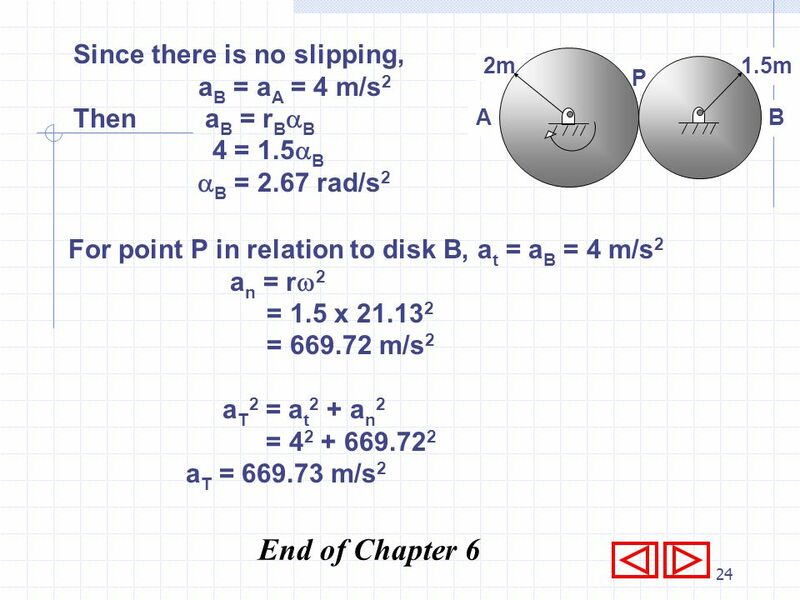 6.1.1	Displacement Displacement is defined as the location of the body with respect to a reference point. It specifies the distance and the direction from the reference point. 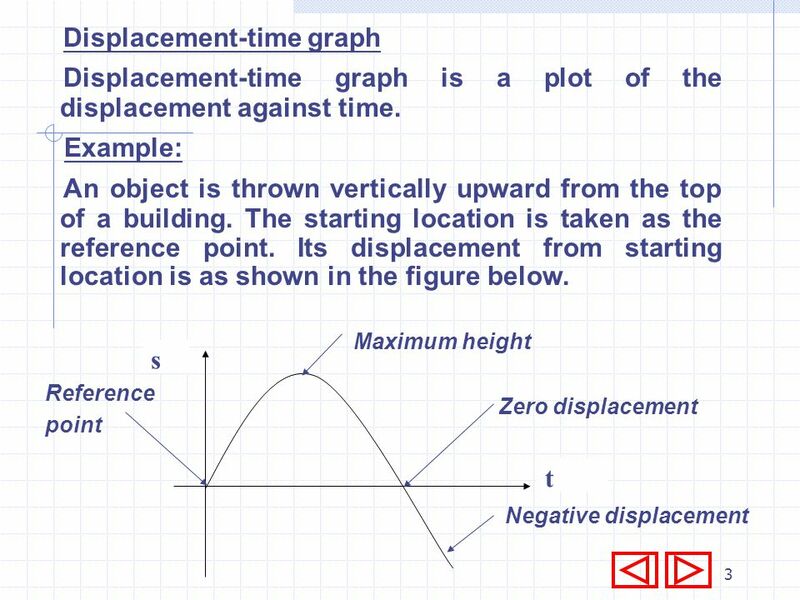 The SI unit for displacement is m.
3 Displacement-time graph is a plot of the displacement against time. 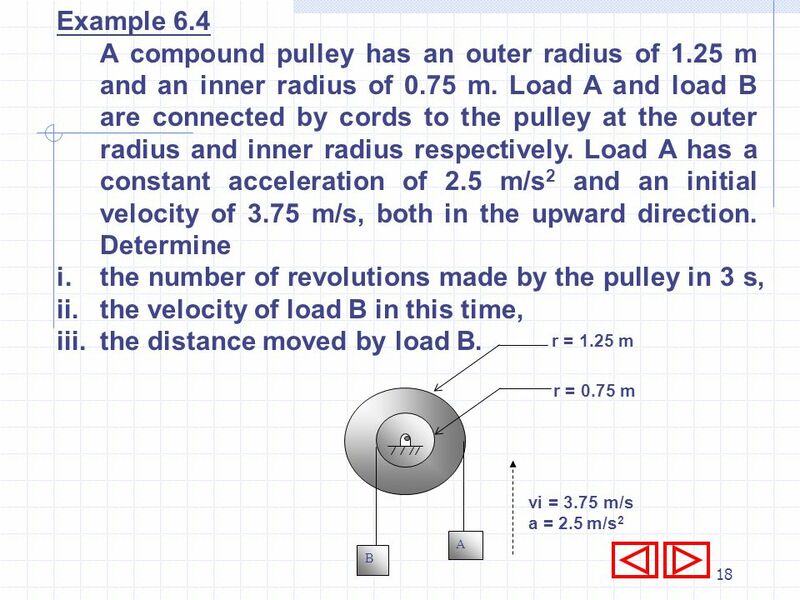 4 6.1.2	Velocity Velocity is the rate of change of displacement with respect to time. 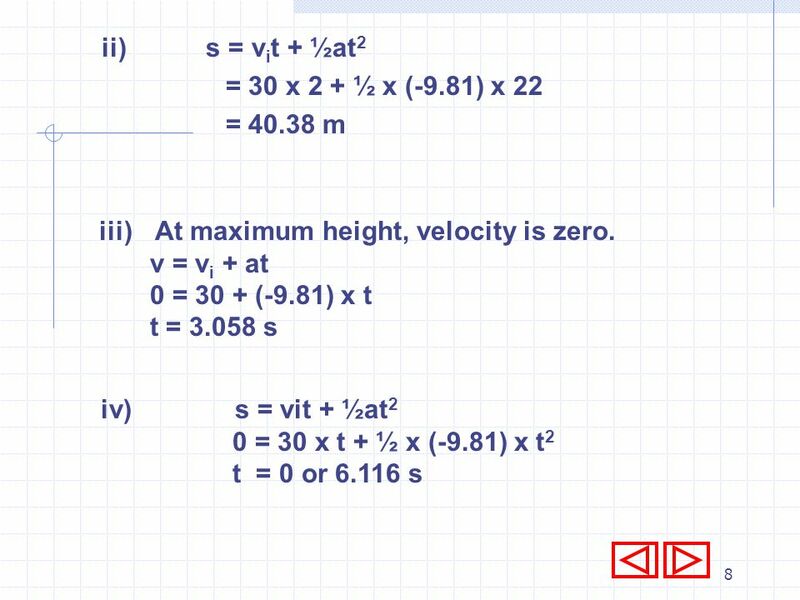 The SI unit for velocity is m/s. 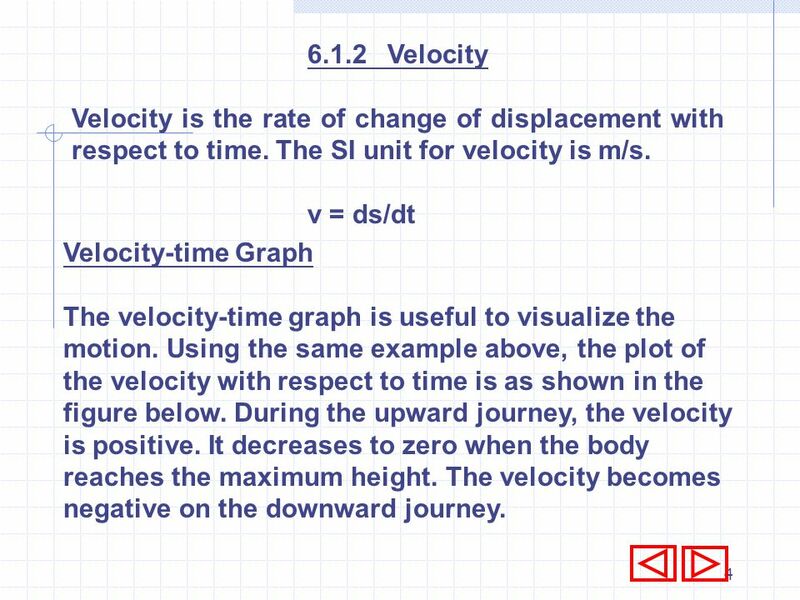 v = ds/dt Velocity-time Graph The velocity-time graph is useful to visualize the motion. Using the same example above, the plot of the velocity with respect to time is as shown in the figure below. During the upward journey, the velocity is positive. It decreases to zero when the body reaches the maximum height. The velocity becomes negative on the downward journey. 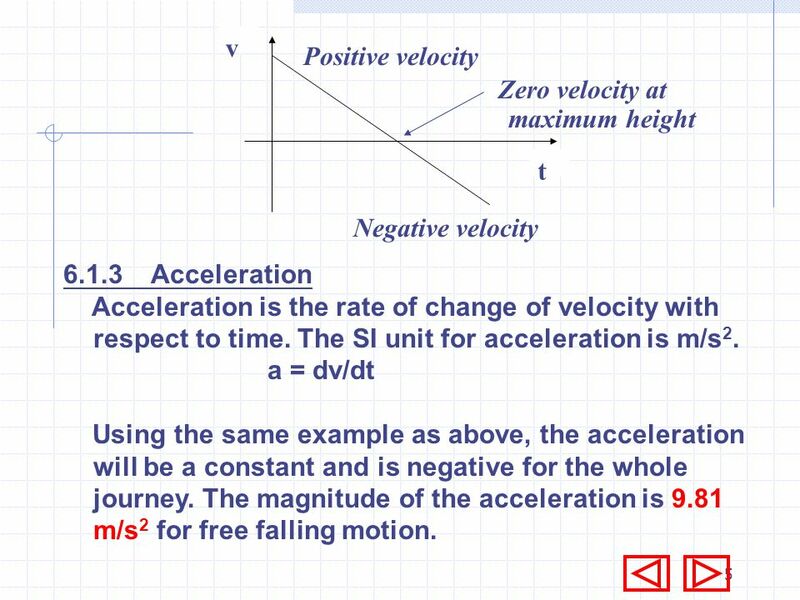 Positive velocity Negative velocity Acceleration Acceleration is the rate of change of velocity with respect to time. 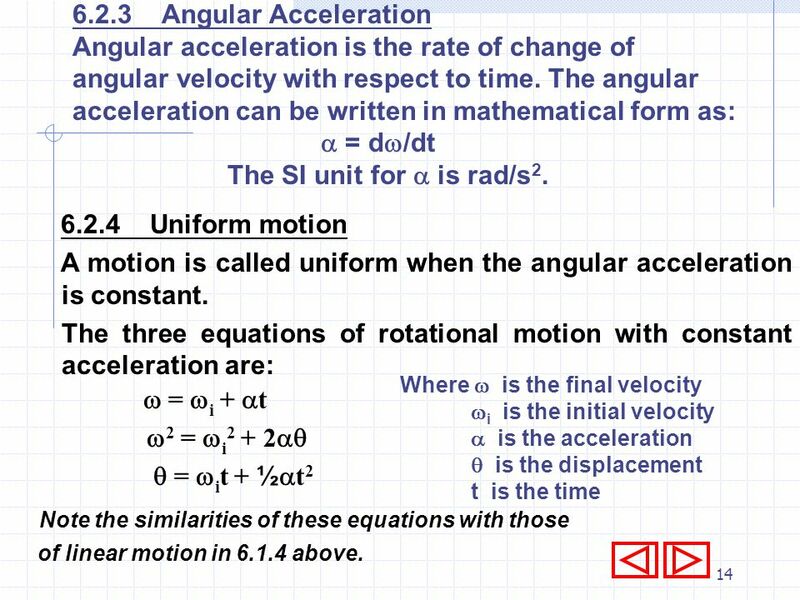 The SI unit for acceleration is m/s2. 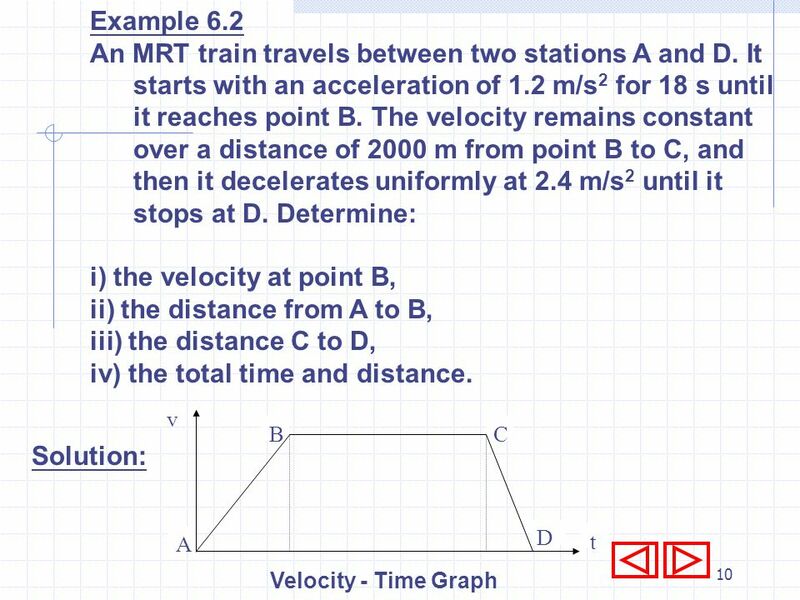 a = dv/dt Using the same example as above, the acceleration will be a constant and is negative for the whole journey. 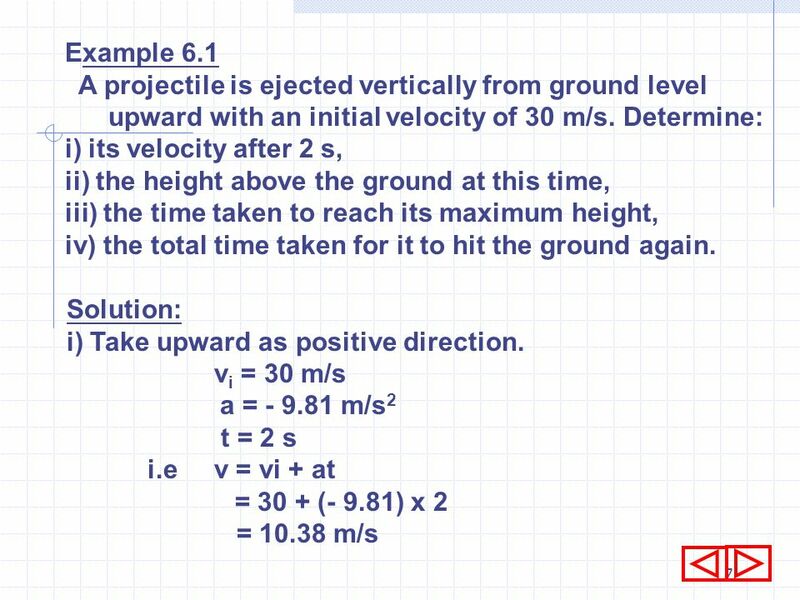 The magnitude of the acceleration is 9.81 m/s2 for free falling motion. 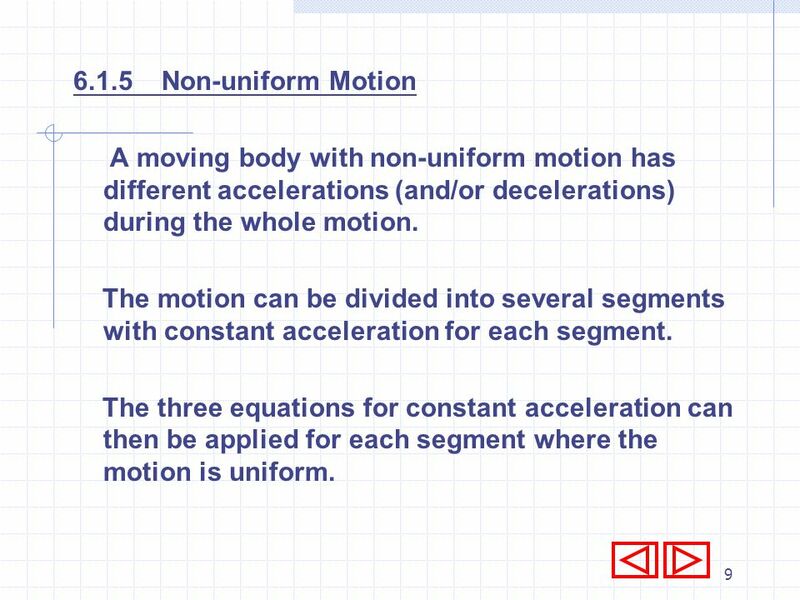 9 Non-uniform Motion A moving body with non-uniform motion has different accelerations (and/or decelerations) during the whole motion. The motion can be divided into several segments with constant acceleration for each segment. 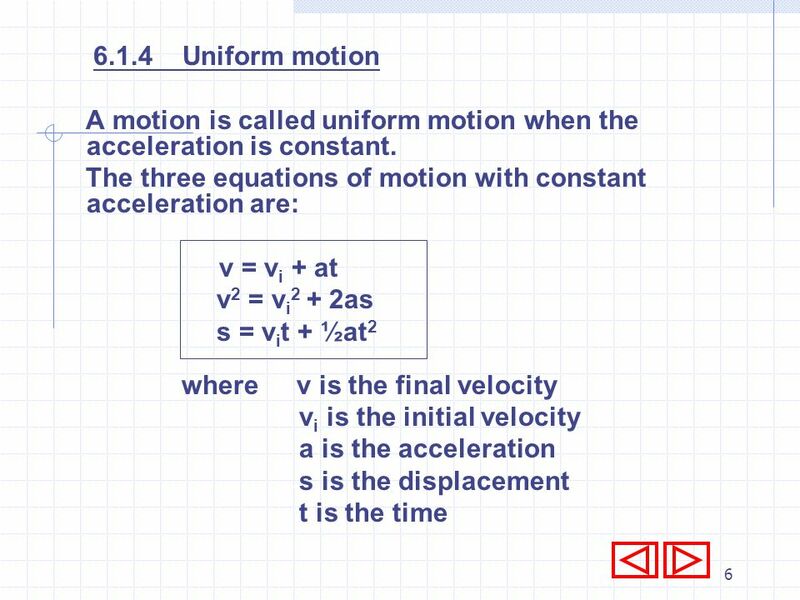 The three equations for constant acceleration can then be applied for each segment where the motion is uniform. 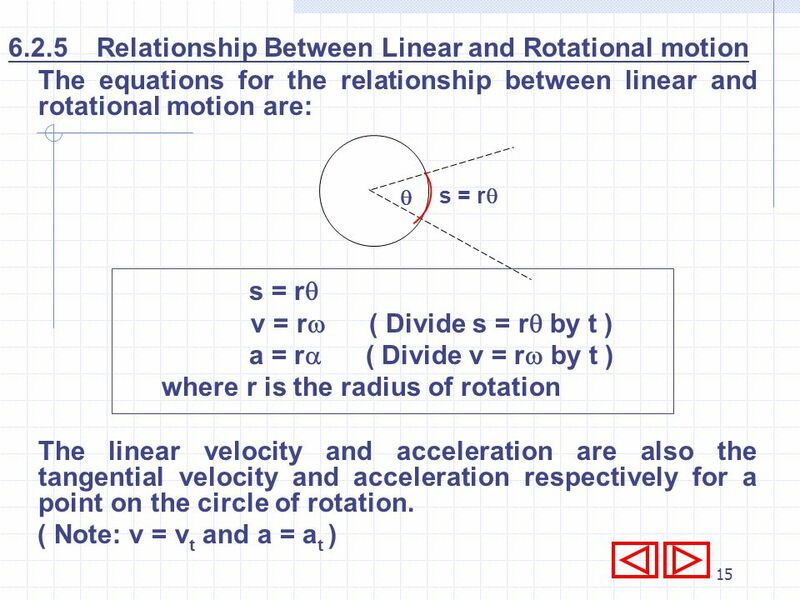 Kinematics of rotational motion involves quantities like angular displacement, angular velocity, angular acceleration and time. 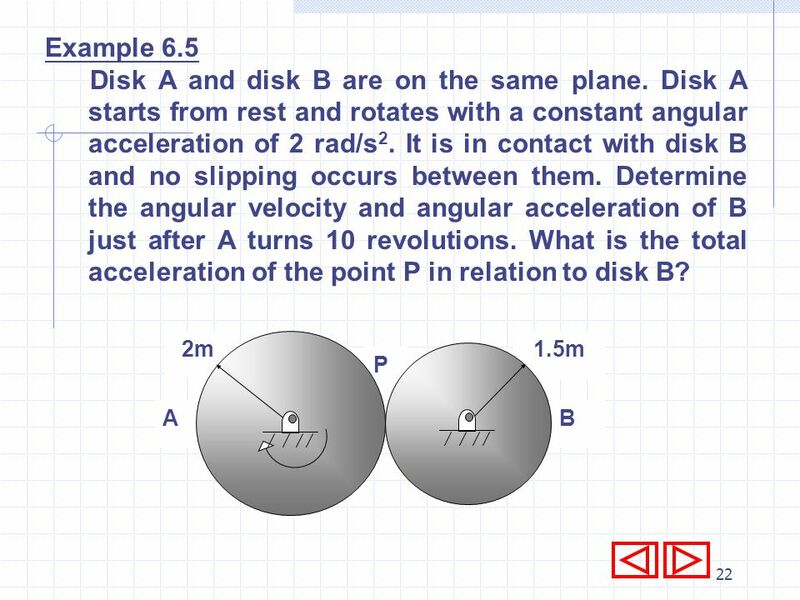 Angular Displacement Angular displacement is defined as the angle and the direction through which a body turns. 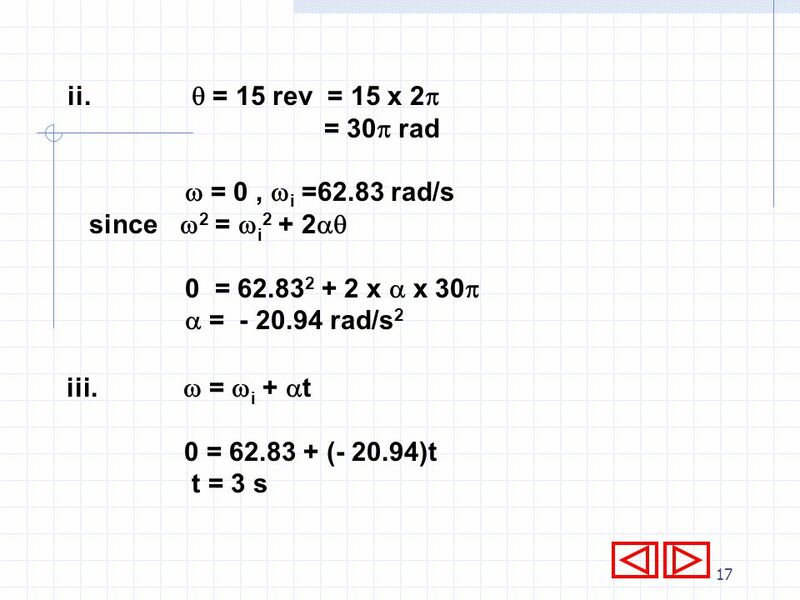 The SI unit for angular displacement is radian (rad). 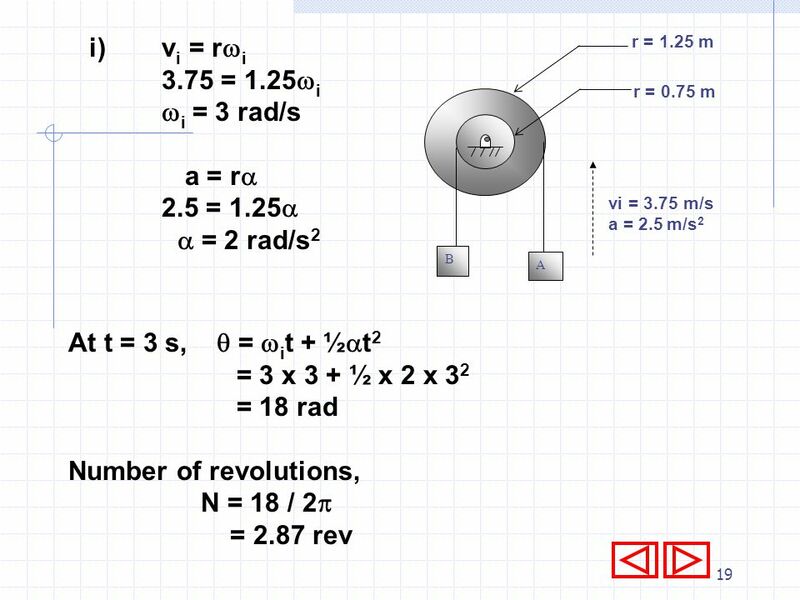 ( Note:- 1 revolution = 360 degrees = 2 radians ) Angular Velocity Angular velocity is the rate of change of angular displacement with respect to time. 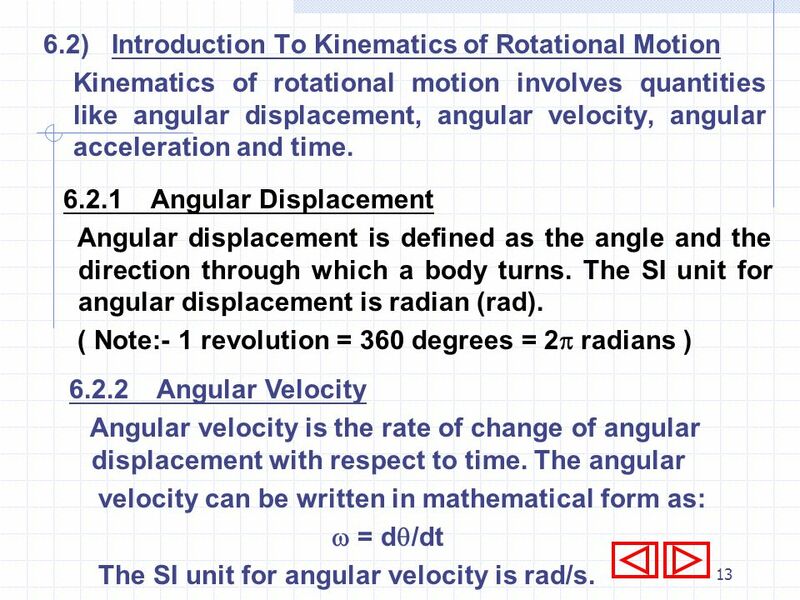 The angular velocity can be written in mathematical form as:  = d/dt The SI unit for angular velocity is rad/s. 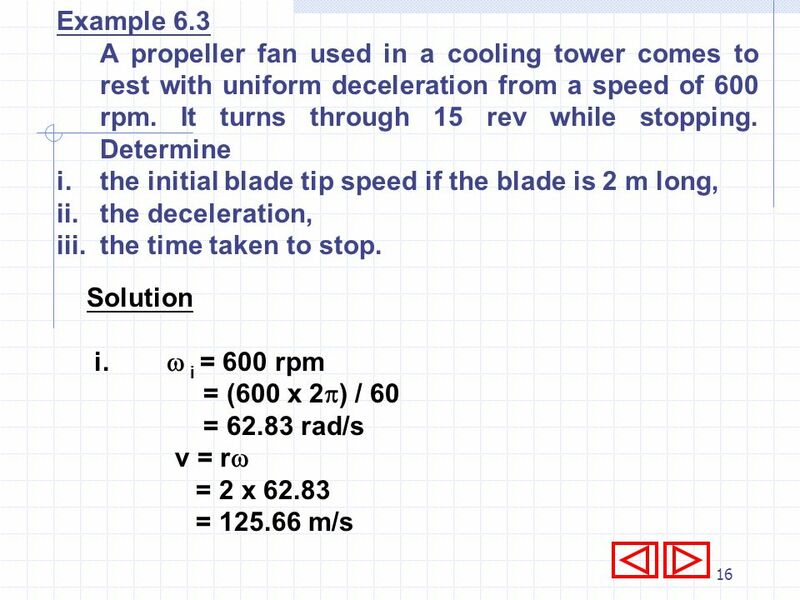 Download ppt "ENGINEERING MECHANICS CHAPTER 7"
Kinematics JUNIOR EAMCET. 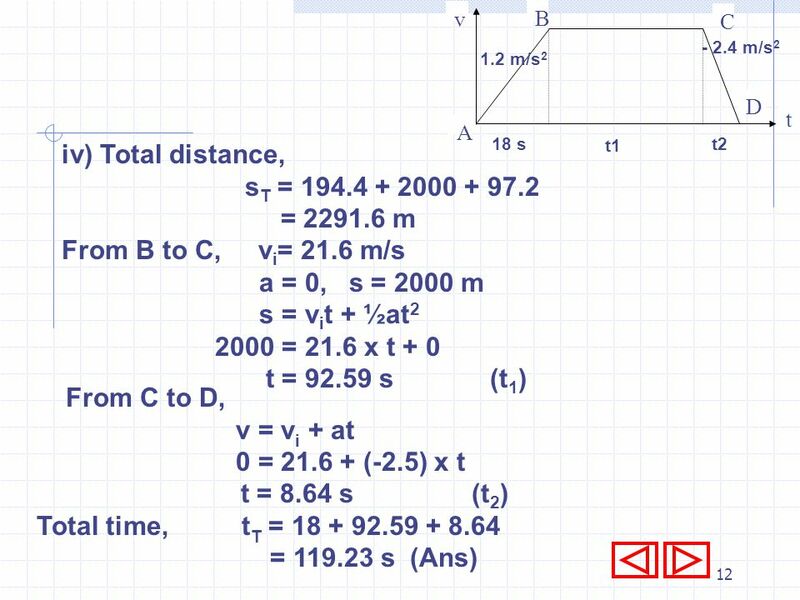 Distance and Displacement O A B 4m 3m 5m O to B: distance is 7m and displacement is 5m. 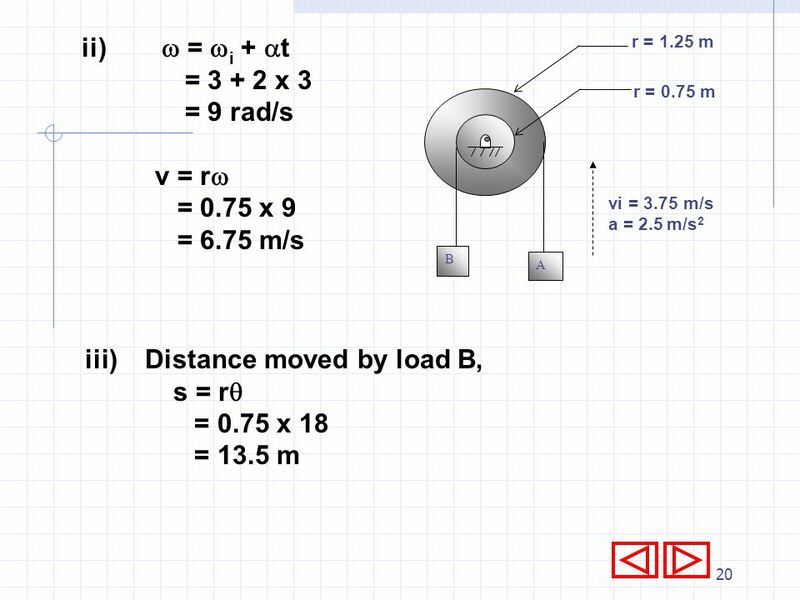 1 Using Kinematic Equations 1. Write down the symbols, values and units (in SI) of given quantities 2. Write down the symbol of the quantities required. April 20 th, )We have seen objects launched horizontally, following the trajectory shown below. 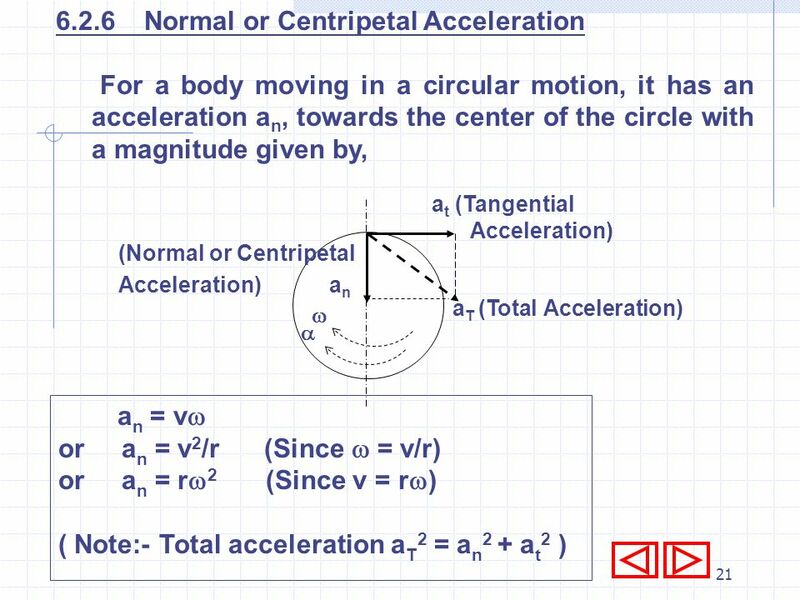 Acceleration & Circular Motion Centripetal Acceleration Tangential Acceleration. 1. What is the weight of a 3.40 kg mass? 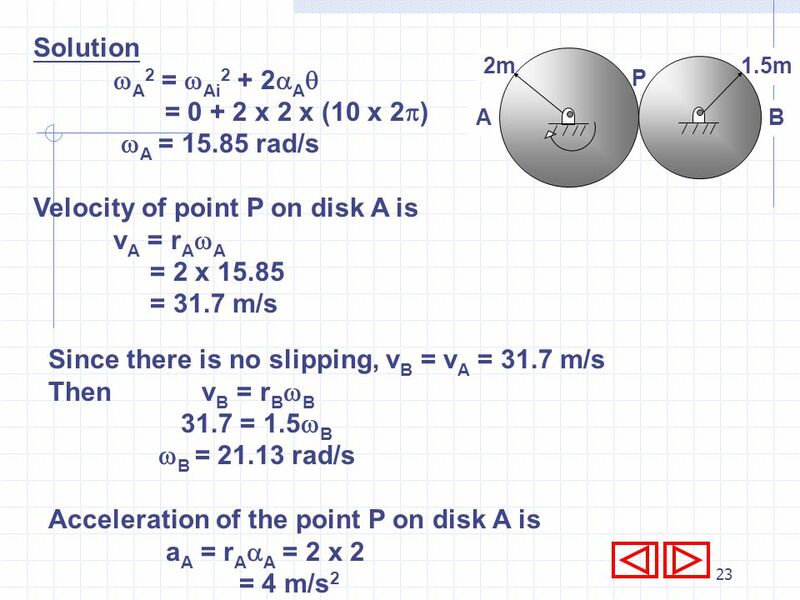 Ying Yi PhD Chapter 8 Rotational Kinematics 1 PHYS HCC.